Looks like Google is starting to push forward with semacodes (ClickZ article). Applying technology to the oldest medium of all = newspaper print. 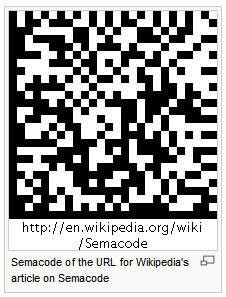 Semacodes are UPC-like codes that you photograph with your camera phone, then automatically sends branded content to your phone, or your phone to a specific mobile site. The official info is at Semacode.com. Still a relatively new technology, although I've seen it mentioned a couple times in the press recently. So expect it to start getting hyped. It requires users to download an application to their phone in order to do it, so adoption in the US will be really low for now. You will hear a lot of marketers and tech companies talk about how great it is in the "theoretical" sense. Which is unfortunately what usually happens with any mobile technology. Right up there with GPS targeting of coupons (I'm still waiting for that SMS coupon from my local Starbucks when I walk past it). Or mobile couponing in general. At least until Google's Android mobile phone operating system launches, in which I bet the application will be built into. It has started getting some penetration in Europe (BMW example). I expect Asia will be first mass users due to their reliance on mobile phones/mobile web. There was some US news earlier this year about it. You can get the mobile app at Scanbuy's site or text "scan" to 70734. Sorry, not for iPhones yet. Sprint even ran a print ad in Wired a couple months ago trying to explain what semacodes are. It was about 8 paragraphs long. Anyone Got a Mr. T Webcam?